Creeped out by the idea of Amazon Alexa or Google Home in your lounge room? This little guy might be more your speed. Robotics and AI company Anki just announced their new ‘family robot’ for the home, and it’s actually super cute. Its name is Vector. It’s about 3-inches high and designed to live on your desk or kitchen counter—it even maps those spaces, so it can roll around and navigate between cups and bits of croissant. Vector is Anki’s push to follow competitors like Jibo and Keecker, and to challenge Google and Amazon in the slightly terrifying ‘home robot’ retail sector. One thing you might notice about Vector: he’s kind of cute. Deliberately cute, actually. 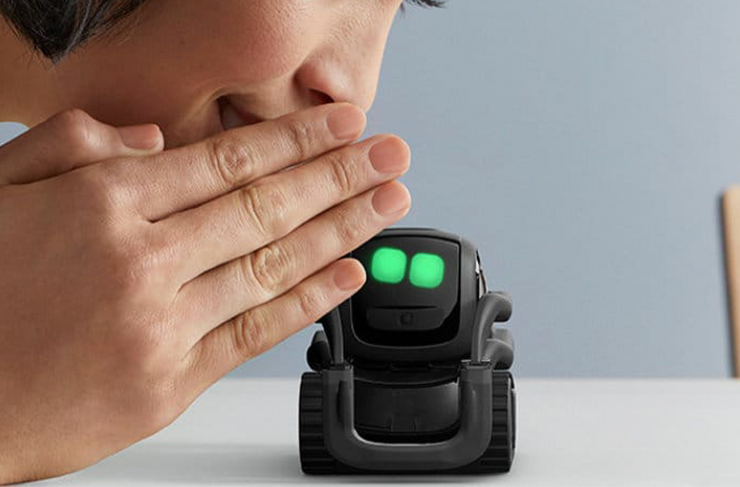 Anki saw a gap in the market for a more ‘emotional’ robot. Something friendly and familiar. That’s why they enlisted Pixar animators to draw Vector’s eyes and IPS facial expressions. This is a robot that will actually get excited when you walk through the door, like a puppy. Vector can recognise your face (and the faces of intruders). You can ask it the weather or the latest news. It can book appointments or keep tabs on your diary. When it gets tired, it looks tired, and will wheel itself back to a charger dock to reboot. You can even stroke it with your thumb (when you do this, Vector’s green eyes roll back and it coos softly—the digital sound of robot pleasure). “We’ve literally seen testers sitting there for 45-minutes, watching a movie and the entire time just petting their robot,” says Anki co-founder Hanns Tappeiner. In other words, he’s basically WALL-E.
Four infrared emitters under each corner prevent Vector from falling off tables and stuff, and there’s a HD camera and four direction mics, to pick up sound and imagery. The idea is that you’ll use Vector like a cross between smart speaker, home helper and family pet. Vector is arriving at an awkward time for home robotics. Mayfield Robotics, who makes Kuri (another ‘always on’ robotic companion) just announced it was refunding pre-order deposits. The Jibo manufacturers just laid off about half their programming team. The question over the next few years will be: do people actually need home robots? And at what point do Vector’s pet-like emotive responses become creepy? Is sitting there in the dark patting your robot friend somewhere we want humanity to be going? Who knows. These are the questions. Vector’s international launch is coming up in October, so you’ll be able to get your hands on one soon. The company are taking pre-orders right now. For more info, check out Anki’s website.